Scotney is not one but two houses. At the top of the hill is the new house, designed by Anthony Salvin in Elizabethan style and built in 1837 for Edward Hussey III, who took the Picturesque style as his inspiration. At the bottom of the valley are the romantic ruins of a medieval castle and moat. This is the focal point of the celebrated gardens featuring spectacular displays of rhododendrons, azaleas and kalmia in May/June with trees and shrubs providing autumnal colour. The estate is open all year, offering a variety of walks through beautiful parkland, woodland and farmland. Scotney Castle is a mile from Lamberhurst, on Sussex soil, but the little river Bewl, or Bead, which here forms the march between the two counties, supplies the moat encircling the castle, and in consequence this is sometimes claimed by Kent. 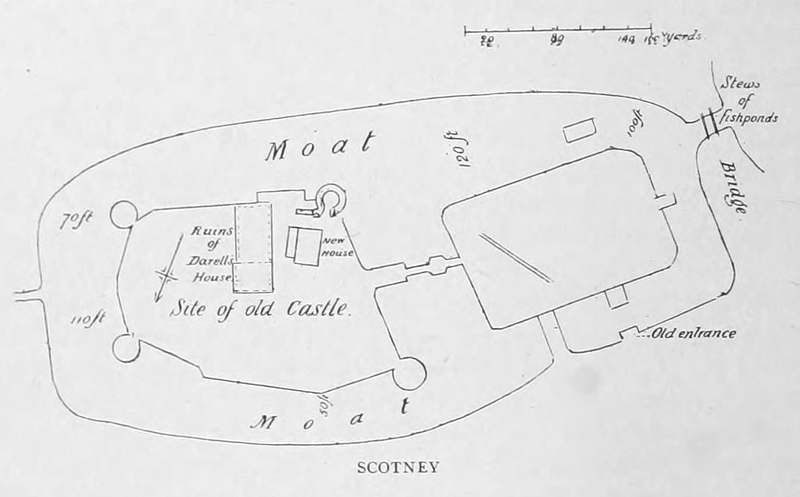 This moat is more like a small lake, which, after the manner of Leeds Castle in Kent, contains two islands upon which the fortified dwellings were erected ; but the water protection was sought more against the sudden attacks of marauders than as a defence in a regular siege, since, from the moat being at a higher level than the river flowing on the other side of its embankment, it could be drained by an enemy, without exposure on his part. This is also the case at Bodiam. Scotney was a small stronghold, of which one only of the four corner lowers of its outer walls remains, having heavy machicolations; this, with the waters of its lake, forms a highly picturesque object. The name seems to have been derived from a place in France, in the Seine Inferieur, near Foucarmont, called Escotigny, from whence came the barons Scoteni who possessed this castle in the twelfth century. Lambert de Scoteny held the castle 1168-1195, whose grandson (probably) Walter de Scoteny, was possessor (temp. Henry ] 1 I. ), and was executed at Winchester in 1259 for complicity in a crime of which he was possibly innocent. In the preceding year, the growing party of the barons had succeeded in obtaining orders of exile against the unpopular family of de Valence, half brothers to King Henry, namely William de Valence, Earl of Pembroke, and his three brothers. Before, however, they could leave the country as ordained, a great banquet was given by Aymer de Valence, Bishop of Winchester, at which several of the guests, including Richard de Clare, the great Earl of Gloucester, and his brother William, were taken ill with symptoms of poison. (Blaauw.) William de Clare and the Abbot of Westminster died, and the Earl himself, under the care of his physician, a Dominican monk, only escaped after a tedious illness, with loss of his hair, nails, and teeth, and his skin peeling away. Suspicion of foul play at once arose, when Walter de Scotney, who was chief counsellor and steward to the Earl of Gloucester, was charged with having administered poison to him and the others. It was believed that he had been induced to act thus from the offer of a large sum by William de Valence in revenge for the exile. He denied the crime, and submitting to be tried at Winchester, was brought there, found guilty, and after a few months, in spite of his protest of innocence, was hanged there. He possessed manors in Hampshire also, and was perhaps a lawyer. He was allowed, notwithstanding the forfeiture which followed his condemnation, to leave Scotney to his family, who had also the manor of Scotney in Lydd. In the middle of the reign of Edward III. this property passed to the Ashburnhams (de Esburnham) of Sussex, when Roger de Esburnham lived there and in 1 Richard II. crenellated the mansion—seemingly without a licence, since none appears in his favour in the Patent Rolls. His successor (temp. Henry V.), alienated Scotney to Henry Chichele, Archbishop of Canterbury, who lived here at times, and in 1418 settled the place on his niece, Florence, the widow of Sir William Peche, on her marriage with John Darell, of Cale Hill in Kent, who was of a Yorkshire family of that name ; in his family it remained many years, until the reign of Edward VI. (Hasted.) In 1774 the property was sold to John Richards, of Robertsbridge, from whom it was purchased by Edward Hussey, grandfather of Mr. Edward Hussey, the present owner. The ancient structure, including three of the corner towers, was pulled down in order to build a new house called Court Lodge, in the same parish. The later buildings, now partially ruined, belong to a house built by Inigo Jones for the Darells. Entrance was originally gained from the mainland by a drawbridge across the moat on the N. of the first island, from whence a second, defended, bridge led into the enceinte of the second island, which was an enclosure of rectangular form, the retaining walls rising out of the waters of the lake, and having a circular tower at each of the four corners, dating from 1 Richard II. (1377). The site of the original castle, of which there are no remains, is on the N. side of this island. In days when the evasion of the excise laws formed the occupation of many a gentleman of Kent, as cattle-lifting once did among the same class in the Highlands of Scotland, the Darell family were noted smugglers, and their deeds and fights with the representatives of law were long remembered in those parts. A story about these is given in one of James’s novels, called “The Smuggler,” and recounts a celebrated contest by a gang of these desperadoes at the siege of Goudhurst Church, upon the neighbouring hill in Kent.